We take our guests’ experience seriously. We expect everyone to treat fellow guests and staff with respect. Guest Services is located on the Main Concourse near section 111. Guest Service Representatives are available to answer your questions, collect lost and found items, provide pre-ordered Assisted Listening Devices and assist our guests. In addition, Guest Services can help with directions, complaints, or provide wheelchair escorts during events. Look for any staff member wearing a Citizens Business Bank Arena logo shirt to provide assistance. The number one priority at our managed facilities and special events is to provide a safe and secure environment for our guests and team members. Collectively, the Ontario Convention Center, Greater Ontario Convention & Visitors Bureau, and Citizens Business Bank Arena is proud to announce the addition of our “in-house” security division - Event Secure. Effective August 2018, Event Secure oversees all safety, security, and guest code of conduct at our venues and special events. M­­ade up of dedicated and motivated professionals who are educated, licensed, and certified to provide a safe and secure environment, this team is a valuable addition to our comprehensive portfolio of management services. Our guests will benefit from one team that is trained to provide services that will offer a higher security standard than individually contracted vendors at each venue. The Event Secure staff is made up of experienced individuals that work together daily. They understand crowd management and guest service. Working closely with our local law enforcement agencies, building relationships, and continually training to stay up to date with today’s security and life safety challenges the Event Secure team can provide the best experience and a safe environment for all our guess. 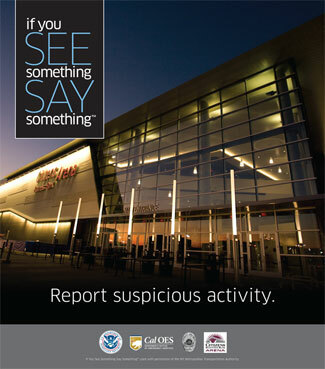 In March 2011, Secretary of Homeland Security Janet Napolitano announced a new partnership expanding the Department of Homeland Security's (DHS) "If You See Something, Say Something™" public awareness campaign to stadiums, arenas, theatres, clubs, convention centers and other venues in an effort to help ensure safety and security of the American public. Citizens Business Bank Arena is proud to participate in this campaign.